Heritage Trail Apartments was named one of Indiana's Top 5 Properties for Reputation Management this month. This month’s issue looks at the top five communities for online reputation in each of the nation’s 50 states (and the District of Columbia)—as well as each state’s average ORA© score.To arrive at a national score, J Turner Research tracks and analyzes the online reputation of more than 52,000 apartment properties across multiple ratings websites, on a monthly basis. To overcome the challenge of multiple ratings scales, J Turner has devised a statistical model to establish a single score for each property. This score, based on a 0-100 scale, serves as a benchmark to compare and contrast individual properties—and portfolios—nationally. For the state average, all properties in the state were considered. However, when considering the top properties in each state, only properties with a minimum of 10 reviews were considered. 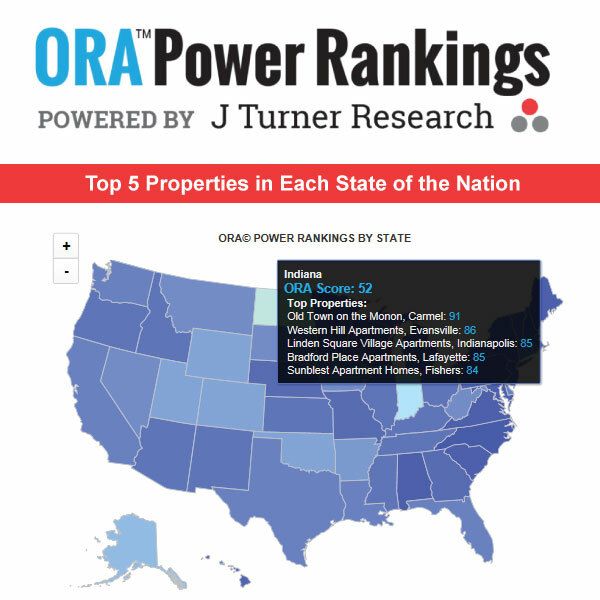 This resulted in Vermont only having one top property as opposed to five, and North Dakota having a state average ORA© Power Ranking higher than the scores of the top properties listed.